Well do know that when you are hungry and stuck in the jam that could ruined your day, so I make sure my tummy is taken care of and we can deal with the traffic later. Sometimes when I am in the rush I skip the bread and salad, I just make a glass of Kinohimitsu Superfood Supreme and I am ready. Kinohimitsu Superfood Supreme comes in light beige powder, all I need to do is mix 2 scoops into 150 to 200ml of cold or lukewarm water, stir well and then drink it. Well you can also mix it into juices, smoothies or anything you like but I prefer to drink it as it is. I like the aromatic fragrant of all the combined 7 colors of super food such as raspberry, mangosteen, blueberry, elderberry, yellow pea, black sesame seed, blackberry, brown rice, cocoa, oat and wheatgrass. It taste like multigrain beverages with a hint of black sesame aroma. Kinohimitsu Superfood Supreme nutritious drink be it for breakfast or anytime of the day and the most important thing is not sweet. After drinking it, I don’t feel hungry so fast and my concentration is better. It is good to keep the hungry pang away in between meal. All the nutritious and fiber in this beverages helps to boost our immune system, anti-oxidant and also promote health digestive and bowel movement. I also keep a tin in my office as and when I am hungry I can have it instead of taking the unhealthy snacks like tidbits, fried food or carbonated drinks. Kinohimitsu Superfood Supreme is not only good for me but also best for my whole family and also children above 12 years old. My parents love it too. It also recommended for the elderly, those undergoing physiotherapy and rehabilitation, athletes, those who have joint stiffness and muscles weakness. 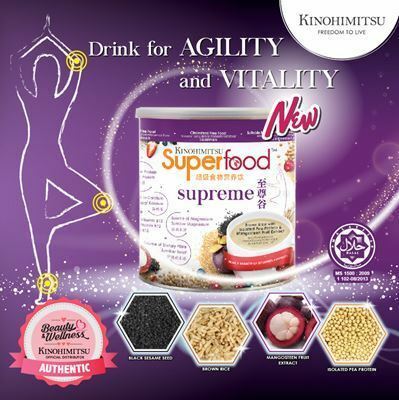 Here are some facts about Kinohimitsu Superfood Supreme, this beverage ingredients are all plant based, it is only 95 kcal per serving, delicious, easy to make, clinically proven anti-oxidant and anti-inflammator, and also an alternative to those allergic to milk and soy milk. It is a nutritional multigrain beverage that promotes healthy bones, joints and muscles, enabling you to stay active to explore life with excitement and energy regardless of age.